The Kaneland United Academy provides girls and boys aged 7 - 9 with opportunities to improve their technical soccer skills in a zero pressure environment. This approach allows players to develop their enjoyment of the game and their individual creativity and technical soccer skills. Training and development are based on core elements developed by US Soccer and is led by a licensed Club trainer. 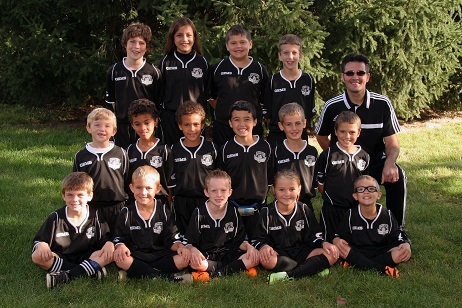 The Kaneland United Academy emphasizes the player and their individual development. Focus is on technique and small sided games, developing the players soccer awareness. The program is available to players in the 7 - 9 year old age groups and it acts as a bridge into higher levels of competitive play. Why is Academy emphasis on the individual player's technical skills and less on team play? In general, 7 to 9 year old players are not little adults and their physical and cognitive development is a work in progress. The National Institutes of Health have a great summary of Sports Readiness of Children and it can be found HERE and HERE and is worth a five minute read. The NIH specifically recommends "Rules should be flexible, instruction times should be kept short and there should be minimal competition". Academy players are transitioning from understanding how to use their bodies to understanding how to work with others. During that transition and to prepare them for team play, younger players need to build their ability to control and build confidence with the ball. Tactical skills - positional play, formations, passing, creating space, moving into positions of support - are concepts that first require a level of technical ability and then are introduced to players and developed in the 10 - 12 year old age range. The curriculum for the Kaneland United SC Academy is proven and matches up with the NIH recommendations and we have found that players graduating from the Academy are better prepared to excel in the older age groups and in competitive play.